﻿Published by Sareth Ney on May 16, 2016 at 6:01 p.m.
GREENWOOD VILLAGE, Colo. - High Elevation Rock Festival inauguration event will take place at Fiddler’s Green, on Sept. 10. Two stages will host 11 hours of music. It will be presented by Mazda and fueled by Monster Energy. Animals As Leaders, Avenged Sevenfold, Chevelle, Killswitch Engage, Lola Black, Ministry, Neck Deep, Pierce The Veil, Sevendust, Shaman’s Harvest, Texas Hippie Coalition, The Amityville Affliction, Twelve Foot Ninja and Volbeat will all be part of the debut of High Elevation Rock Festival. Presale tickets for High Elevation Rock Festival will be available for purchase on May 18 at 10 a.m. Mountain Time and conclude on May 20 at 9:59 a.m. via their website. The password to purchase presale tickets will be available on their social media pages. On sale to the general public will begin on May 20 at 10:00 a.m.
Presale tickets range from $59.50 (general admission lawn), $69.50 (general admission seated), $79.50 (general admission pit) and $198 (general admission lawn four packs). The prices are excluding service charges and fees. A limited number of discounted ticket four-packs will be available for active military courtesy of GovX at govx.com. Hotel packages will be available for purchase. They include premier parking and festival shirts for each person. 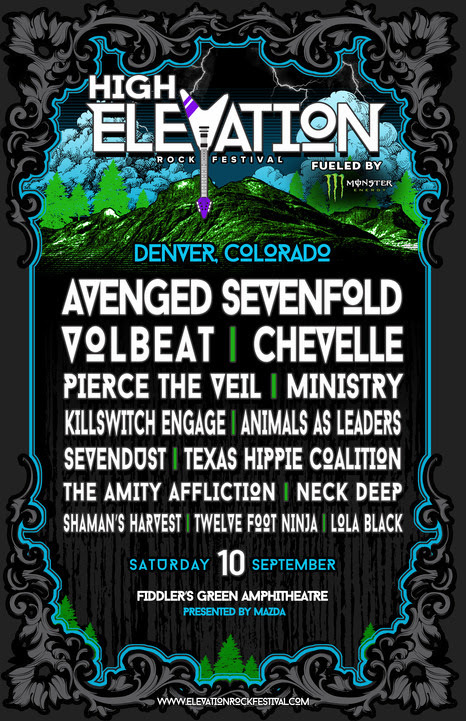 AEG Live is producing High Elevation Rock Festival. They are the producers of Rock On The Range, Monster Energy Carolina Rebellion, Rocklahoma, Northern Invasion and other U.S. rock festivals. They are based in Los Angeles and are dedicated to all live contemporary music performances including: touring, festival, broadcast, merchandise, special event divisions and 15 regional offices. They own, operate and book 35 state-of-the-art venues. To visit High Elevation Rock Festival fueled by Monster Energy’s official website, please click here. To like them on Facebook, please click here. To follow them on Instagram, please click here. To follow them on Twitter, please click here. Please use the hashtag, #HighElevation, when tagging on social media.